The LD Systems Maui range is well established by now — we first looked at it in 2012 — and we recently reviewed the compact Maui 11 G2 (second generation) rig. This time, we’re looking at the flagship Maui 28 G2, which replaces the older LD 28 Mix and follows a similar format but weighs in with twice the power. The two-part column format shared by these systems exhibits well-controlled dispersion characteristics that helps put the sound where you want it, while the multiple small drivers in the columns help keep the crucial mid-range clean by eliminating the need to put a crossover right in the middle of the vocal spectrum. The Maui 28 G2 comprises a two-part aluminium column and a fairly compact but very solid ported birch-ply sub. The sub houses two heavy-duty, eight-inch woofers with two-inch voice coils and has side carry handles built into the woodwork. It weighs a hint over 20kg while the whole system weighs only around 32kg, making it very manageable. Unfortunately a carry bag for the columns, which I’d consider as an essential, isn’t included as standard, but there are plenty of mic-stand bags that will do the job if you don’t want to buy the official optional covers. Handling the mids and highs are 16 three-inch cone drivers, eight for each of the two column sections, plus a one-inch neodymium compression driver in each feeding a waveguide to match their directivity to that of the line of cone drivers. While the system is compact, the Class-D amplifier section built into the sub can deliver a total of 1000 Watts RMS, or 2000 Watts peak. Like its smaller sibling, the sub also houses a small, basic four-channel mixer that can also be used to stream audio via Bluetooth, while a DSP engine looks after all the filter and protection duties. The audio conversion is at 24-bit, 48kHz and the DSP feeds the power amps via a three-way crossover as well as taking care of time-alignment, compression, multi-band limiting (using LD’s DynX control technology) and other protection duties. Multi-pin connectors link the columns and sub where four thick steel locating pins add strength to each joint. A peak SPL of 126dB at one metre is available, and the frequency response is quoted as 45Hz to 20kHz. 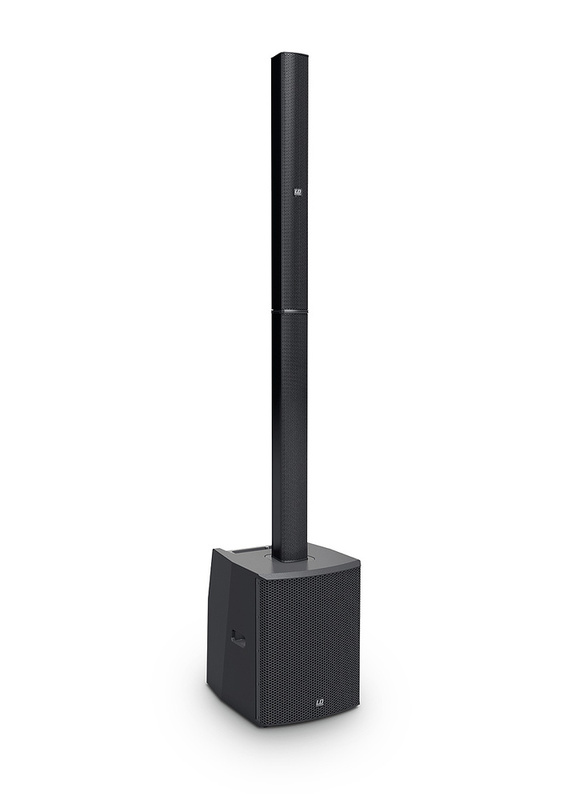 A single system provides a wide mono coverage (120 degrees horizontal by 20 degrees vertical) suitable for solo performers, duos or acoustic ensembles, while two can be combined to form a powerful stereo system. On the top of the sub are controls for setting the sub/top balance and for adjusting the overall level. Status LEDs indicate power, signal present, limiter action, protection engaged, setup configuration and mono/stereo configuration, the latter for use with a second system or other powered speaker. They also indicate if the columns are being set up separately from the sub, as is possible using optional hardware. Power comes in on a standard IEC connector. The mixer section is very basic and doesn’t include EQ or effects. Only one of the four channels can accept a microphone, though its combi input socket can also take line-level signals. 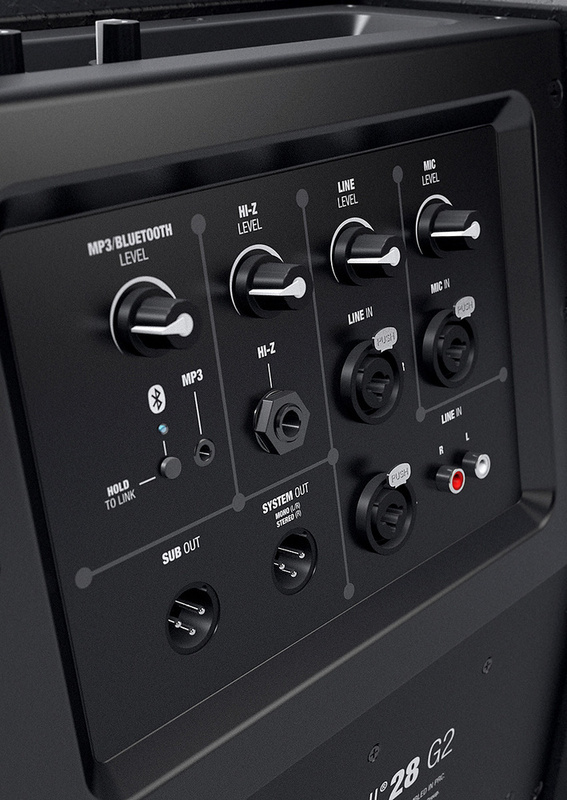 The next channel has two combi inputs labelled left and right plus a pair of RCA phonos, but this channel is only for line-level signals and if you want to use the XLR/jack sockets and phonos at the same time, which the mixer is designed to allow, then you’ll need to be able to adjust the phono input at source to enable you to balance it with the XLR/jack inputs. The subwoofer also houses the system’s basic input mixer.A third channel has a quarter-inch jack socket with a high input impedance to allow it to accommodate instruments. The final channel is reserved for Bluetooth connection or stereo mini-jack analogue sources, and again both may be used at the same time as long as you have some external means of balancing the levels. Below the channel level control is a Bluetooth pairing button and status LED. 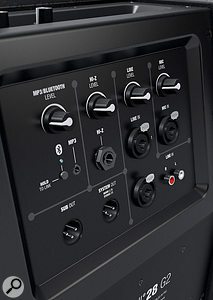 Any stereo inputs are summed to mono unless a second system is connected and the mixer switched to stereo operation, in which mode a balanced XLR provides the system output for feeding the other half of the system. There’s also a separate filtered sub out for feeding a second powered sub where more LF power is needed. The use of plywood for the sub, combined with a metal plate housing the connector and supporting the column, gives the system a solid, well-engineered feel. The column segments can be a little stiff to insert when new but at least everything feels sturdy. Like the 11 G2, the Maui 28 G2 reproduces vocals well; the general clarity is excellent and the bass end comes over as tight and well-controlled. It’s not quite as hi-fi-sounding as my similarly powered Fohhn system — but that cost a great deal more, and the Maui is still surprisingly good and far more natural sounding than most conventional ‘box’ speakers. 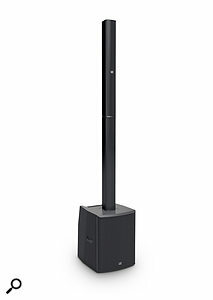 At under £1000$1200 for a 2000 Watt peak PA system, the Maui 28 G2 offers great value and certainly delivers on the fidelity front, though ultimately it is the clean SPL capability that matters rather than simply going on electrical Watts. While a peak SPL of 126dB is pretty loud, there are many affordable 10- and 12-inch two-way systems that can produce similar levels, so don’t expect to take on an outdoor festival with these speakers. On the plus side though, the sound remains clean even when you crank the level up and the low end is rather more impressive than you’ll hear from most smaller-box speakers used without a separate sub. Given how basic the mixer is, you’d probably need an external mixer with EQ and effects in a typical gigging situation, but it’s good to have something basic to fall back on if you need it. Considering their attractive price and robust build quality, these LD mini line arrays produce a good sound balance right across the audio spectrum, they put the sound where you most need it and they are very kind to vocals. They also take up little space in the car, they don’t block sight lines and they are quick and easy to set up. If you’re on the lookout for an affordable but compact mini line array-style system to use in pub-sized venues, this is one to add to the ‘must try’ list. Though there are several companies now building these mini line arrays, the HK Elements system is probably the main competition. Mixer may be too basic without outside help. I really would have liked a bag for the tops included in the price. The Maui 28 G2 is a good example of an affordable mini line-array system, and it packs more than adequate power for smaller venues.